We’ve all thought about it. As the elevator door closes to descend, that moment of dropping provides the perfect chance to improve your understanding of physics. The concept of jumping in a moving elevator has fascinated people since the early days, capturing our imagination and pushing the boundaries on daily travel and convenience. While jumping up and down in a moving elevator cab may sound great, the reality is that this process can result in unwanted consequences that can prove costly for your time and your wallet. If your elevator’s interior or exterior elements are looking in need of replacing, it’s important to find a company known to provide top-quality elevator parts and services. For years, Kohtler Elevators has worked to become your trusted source for luxurious and reliable operations to ensure that your commercial elevators are running smoothly at all times. 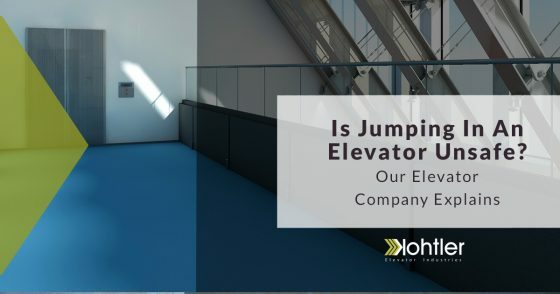 Jumping in a moving elevator can be a fun experience for riders of all ages, but it’s important to remember that there are risks associated with this activity. Today, we’ll highlight how jumping can be hazardous for both the elevator and its inhabitants. If you’re in need of top-notch elevator parts, including replacements or upgrades, be sure to call us now! Property managers understand the need for proper rules and regulations to protect equipment from unsafe use. If your commercial elevator were to be jumped in repeatedly during movement, the likelihood of a breakdown would increase steadily. Local authorities are now beginning to draft official regulations concerning elevator jumping. In New York, for example, elevators now post signage that claim that jumping in an elevator can cause damage and is therefore considered tampering, a Class A misdemeanor. Repeated actions can quickly wear down the valuable elevator parts you rely on for daily use. Mechanical damages to your suspension system can prove very costly, especially if safety components are affected. Many property owners are happy to implement rules forbidding jumpage, as the breakdowns can disrupt the daily convenience for guests or tenants. One individual will not likely cause immediate problems, but groups of people jumping in tandem can create enough force to trigger certain failsafes. Keep in mind that modern elevators are built to be safe, relying on sensors that detect misfires or breakdowns along the line. A sudden jolt on the cables can activate the safety stop, protecting inhabitants from potential problems in the immediate future. Failures must be rectified and cleared before the cab can continue moving. Unfortunately, this added safety feature can result in the elevator becoming stuck in transit. If you remember the story about seven drunk brokers that all jumped in tandem in London, you’ll remember that they broke the elevator they were riding in. This resulted in hours of idle time as they awaited rescue. Elevators are built to be safe, and this added feature is only convenient when utilized in an actual emergency. While these products are safe, the process of rescuing stuck individuals can prove much more hazardous. First responders are in danger, as well as inhabitants. We recommend discouraging jumping in your elevators, as the costs and dangers aren’t worth the experience! Can Jumping in a Falling Elevator Save My Life? From inside the elevator cab, you will have no way of knowing when exactly to jump to attempt to reduce an impact. Physics dictate that moving downward with gravity will create momentum that will increase the force of your impact. Jumping at the last second will temporarily reduce your momentum, but the final result will be nearly the exact same. Ultimately, the performance and durability of your elevator will rely on the quality of your parts and maintenance services. Buildings that rely on inferior elevator parts and shoddy workmanship will likely experience much more frequent breakdowns. Faulty equipment will be much more likely to fail under duress, creating unexpected stops that can leave your building’s inhabitants frustrated and anxious. It is essential to invest in the best elevator parts to ensure that your building will operate smoothly on a daily basis. Jumping in an elevator can sound fun, but it is often not worth the effort. Individuals may find that they can hop around with no ill effects, which may result in damages under the surface of your system. In some instances, causing a large jolt can cause your elevator cab to halt, necessitating rescue measures. If you’re in need of beautiful, long-lasting elevator parts, Kohtler Elevators is here to help. We’re as dedicated to your success as you are, so be sure to call us to schedule a consultation today!